“By the time she was fourteen years old, Marnie Gunn could swim like a fish. Hardly a day went by when her flannel shift was not hung out by the fire to dry. Often as not, it was still damp in the morning when she pulled it back on and went to the beach with Ma to at ten to Smoaker Nash’s bathing machines. Marnie Gunn has liked the past 9 years as a cripple, lame in one leg following a bout of polio she is regarding as the towns crazy person, a fact that is not helped when she dares the rat-catchers boy to go swimming with her and he drowns. 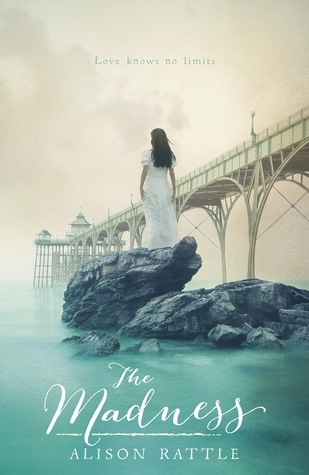 She is lonely in Clevedon, with a mother who hates her and believes she will never wed and no father to speak of, that is until an unlikely friendship sparks up between her and the Lord of Clevedon’s son, Noah. following their secret nighttime swims Marnie starts to become attracted to Noah believing there will be a future for them, but Noah is simply having fun and does not return her feelings. Its up to Marnie to make him see what she believes are his true feelings, instead of hiding them away behind his mask of propriety. Wow, this is a tale of unrequited love and a half! The Madness is quite simply, mad, and whilst it was enjoyable, it was also quite scary to think of someone becoming that fixated with another. The story was enjoyable and it built up really well. A friendship blossoms where it shouldn’t and turns into a little more, Marnie as a naive victorian girl thinks this is love whereas Noah, being a lords son and soon to be man of business, knows that this is fun, his stepping stone to finding out what a woman is and what she can do. Its incredibly sexist and socially wrong to think the way Noah does, that the lower class women are good for nothing but whoring and testing out techniques on, but thats a sign of the times and I liked that he still kind of got to know Marnie first. He has feelings for her, you can tell that, but he knows he’s not allowed to and doesn’t become attached. Marnie on the other hand becomes obsessed with him, claiming to be pregnant by him when she’s obviously not and fantasising about living together in the Manor. Its all rather creepy but brilliantly executed. I hated Noah for his pompousness and the fact he knew he was leading Marnie on, but he was very charming and this is what won me round within the story. I liked that he was actually normal around Marnie and his character would have been brilliant if he wasn’t born into the higher class. Marnie was a troubled girl and you could pretty much tell that from the start, she was confused about her father, she knew her mother hated her for her lame leg and she was constantly being told that no one would ever want her cos of it. I’m not surprised she got attached when someone like Noah paid an interest and I did feel sorry for her until her obsession became too much, then I pitied her and was actually quite scared of her. The Madness really gets into the obsession and the train of thought of Marnie. Whilst reading you really understand how she can about these conclusions even though its obvious to you that those weren’t the conclusions to make. There are parts of the book where you will be shaking your head and wanting to shout ‘don’t do that silly girl!’ but there are others where you want to sit her down and talk to her gently and maybe give her a hug. I loved the writing because it really gave you a proper glimpse into the world of Marnie and I liked that it wasn’t told from her point of view so you could also stay objective, almost like a friend of hers. It really was a great book, especially if you enjoy romances and maybe are a fan of the older classical romances like Jane Eyre and the Austin novels. I did enjoy it but I have to admit I was a little disappointed because I believe Alison Rattles first book, The Quietness was so much better, but it definitely hasn’t put me off the author and I hope for more to come from her soon. I also have to add that I adored the ending of the book and thought it finished perfectly, I would love to discuss it with other readers in order to find out if others felt the same way as me or not but obviously it would contain spoilers to do so here! The Madness was published on March 6th 2014. My copy was sent to me from the publisher in exchange for an honest review. My grandparents loved in Clevedon and I spent a lot of time there. Can’t wait to read this.